If you've been in any store since Halloween (heck, even before Halloween) you've certainly noticed that the "Holidays" are here. You may not being thinking too much about your Christmas/Hanukkah/Kwanzaa/Winter Break plans yet, but retailers absolutely are! And in our little fast food world, the "Holiday" items are rolling in! So far, Jack in the Box and Chick-fil-a have special Holiday shakes. But shakes don't fulfill our Holiday cravings in the morning.... Dunkin' Donuts to the rescue! Dunkin' Donuts has a bunch of things for us, including seasonal menu items, gifts and special deals. As mentioned and shown above, Dunkin' Donuts and Munchkins are available now with festive holiday-themed decorations and icing. Now you can put the office in a festive, holiday mood when you pick up the office donuts in the morning! Another new item is the brownie topped with chocolate icing, white chocolate shavings and chocolate drizzle. The new Holiday Dunkin' Donuts deal: you can purchase a bagel with cream cheese for just 99 cents when you order a medium or larger hot coffee. 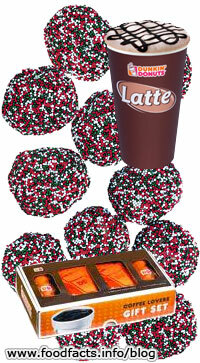 If you're looking for a holiday gift for a coffee lover (without blowing the lid off of your budget), Dunkin' Donuts has several gifts available in participating stores and at www.DunkinDonuts.com, including the Dunkin' Donuts' Coffee Lover's Gift Set (over the Munchkins in the photo above), which includes two pounds of Dunkin's Original Blend coffee and two thermal travel mugs, for $19.99.